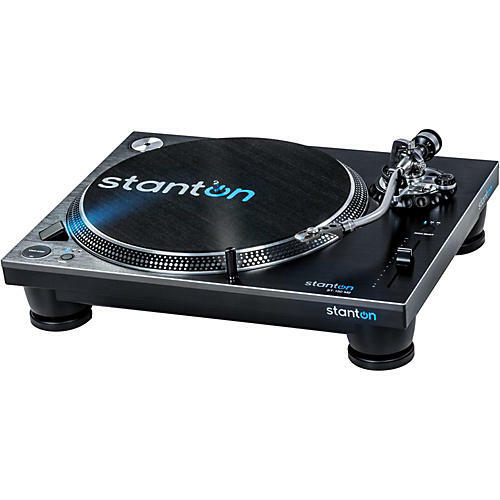 Stanton went back to basics and reengineered this no-nonsense DJ turntable from the ground up. The ST.150 M2 has everything a professional DJ needs and nothing they don’t. From its heavy-duty steel construction to its ultra-stable S-shaped tone arm, this pro-grade turntable is designed to deliver reliable, unwavering performance under demanding conditions. Boasting the world’s strongest-torque motor, the ST.150 M2’s stable platter can start and stop on a dime so you don’t miss a beat in the heat of battle, or deep in the mix. With additional features including reverse and up to 50% pitch adjustment, the ST.150 M2’s innovations keep it ahead of the pack, and give you the tools you need to elevate your game. For example, there are two start/stop buttons for battle-style mixing, and a DSP key lock feature that lets you change the tempo without affecting pitch. Thanks to the included Stanton Trackmaster V.3 cartridge, slipmat and cables, this turntable is ready to get to work right out of the box.